1In a medium size sauté pan melt the butter with the finely diced garlic and cook for 2 minutes. Add the ¼ cup wine and cook for another minute. Add the peeled shrimp, the shrimp, shrimp peels, sprinkle some salt and parsley and mix well so all the shrimp get evenly coated with the butter-garlic mix. Cook them for 5 minutes, or until shrimp are cooked. 2Heat 2 tablespoons olive oil in a saucepan over medium heat. Add the minced sweet onion and garlic and cook until soft, about 3 minutes. Add the chopped zucchini, salt and slow cook for 20 minutes. Whisk it and add sundried tomatoes to the mixture. 3Cut the poached shrimp in half. 4Bring a pot of 6 quarts of salted water to a boil. Cook the shell pasta until al dente, look at the package instructions. Drain well using a colander. 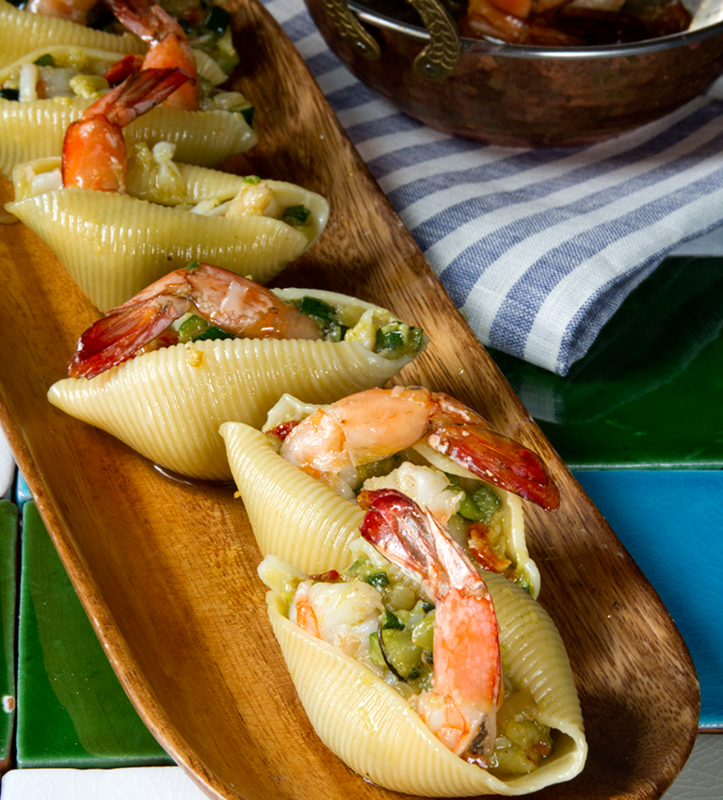 Fill each shell with the zucchini-sun-dry tomatoes and add half shrimp piece. garnish with chopped parsley and serve.